One of the things that make Zotero most useful — and most fun — are the many options it provides for customization and applications via the API or in the form of plugins. Here are some I have come across recently. ifttt.com is a neat little service that lets you create little scripts that have different webservices interact without actually doing any scripting. It stands for “If this than that”. It offers about 80 different channels—webservices, email, text messages—that you can set up either as triggers (the “if this” part) or as actions (the “then that” part). There is currently no Zotero channel and no possibility to create channels of your own (though you can request the former and the latter is planned. You can, however use adding an item to Zotero as a trigger by using the “Feed” channel. Here’s a “recipe” I created that will create a WordPress blogpost for every item added to a group, inspired by this job offer. 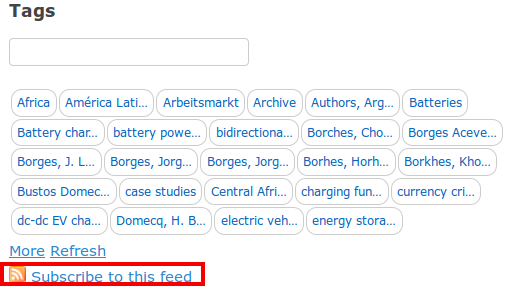 You can easily create feeds not just for an entire library, but also for a collection or a tag. Simply click on the collection (or tag) in the online display of your library and then find your feed address at the bottom left. For private libraries, you will need to click the link to create a private key first. 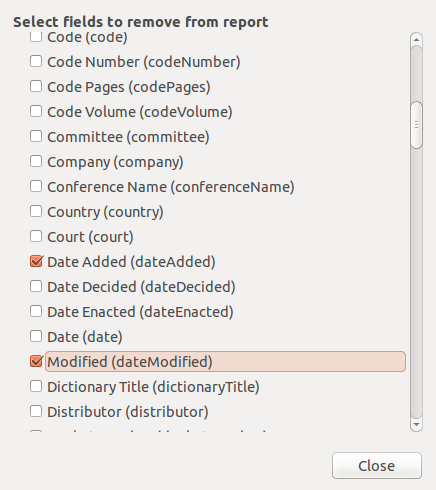 Zotero Autoexporting can export in any of Zotero’s export formats, so you could also uses it to, e.g., keep a MODS version of your library or to echxchange data with another program regularly. If you’re using Bib(La)Tex, you may also want to consider using Emiliano Heyns’s Zotero Better BibTex. It adds a number of convenient features and more flexibility to Zotero’s bibtex handling, including the ability to set custom citekey’s via the extra field and drag&drop citekeys. Some of these features are (by necessity) on the hackish side of things, so you may need to redo some things once they’re properly supported by Zotero, but until then they allow you to use Zotero as a much more sophisticated bib(la)tex front-end. Emiliano has been on a roll recently and published several other plugins, two of which strike me as especially useful. The first one, Report Customizer, takes Jason Priem’s Zotero Report Cleaner and turns it into a plugin. This makes it easier and faster to use and saves your settings. Simply install the plugin and then, in its preferences (which are accessible through the Zotero gears menu), check the box for fields you do not want included in reports, e.g. Date Added and Modified in the example below. The second plugin works mainly behind the scenes: Zotero AutoIndexing implements a different indexing algorithm for Zotero and runs it automatically. The algorithm is significantly faster than the one used by Zotero, so this will be very useful for people adding a lot of large PDFs. (Its downside is that it will not work correctly for several non-Western languages like Chinese). As a bonus feature, the plugin also extracts new annotations from PDFs if you have the indispensable ZotFile installed. On a personal note, I have written back and forth with Emiliano a couple of times, and he has been incredibly fast in addressing any issues that have come up, so I can recommend installing even early versions of his add-ons. As a non-Mac user I’m mainly jealous here, but the new ZotQuery looks too good to not mention it: It is a Zotero workflow for the popular Alfred productivity software that allows quick searches of your Zotero libray and opening of attachments (not unlike Qnotero), and, via the Zotero server API, will even create bibliographies in markdown. (Edit: the above link now points to the developers blog with in-depth documentation). This entry was posted in Tools and tagged add-ons, bibtex, reports on January 11, 2014 by adam3smith.